Name tags are part of many people’s daily lives. They are worn at department stores, restaurants and many other places in order to identify the wearer to the patrons of these establishments. 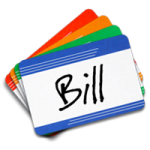 Pulling from the definition of a name tag: it is an identification label worn as a means of showing one’s name and/or affiliation. Scott Ginsberg has come up with a philosophy about wearing these name tags. “”Everyone should wear name tags, all the time, everywhere, forever.” Scott is The Name Tag Guy. He is the only person in the world who wears a name tag 24-7. 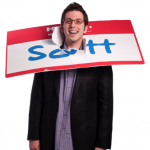 He has taken this simple idea and turned it into a business and his adventures have earned him recognition as “The World’s Foremost Expert on Name Tags.” Scott has written several books on approachability, marketing, branding, leadership, creativity and business strategy. He also speaks about these topics. These special people taught Scott a great lesson and everyone else can learn the same. Name tags may be a standard in many places, but they are unique. They present you in a way that is very specific to you. No one else can take credit for you, except you. So, in answer to the original question, YES! It become necessary at a point in everyone’s life to wear a name tag.